Lindenwood gymnast Breanna Franklin performs her floor routine at the team's home opener on Jan. 19. Franklin scored a 9.8 in the floor competition. The Lions finished first with a total of 194.5 points in the tri-meet against University of Alaska-Anchorage and Centenary College. Andrew Rogers from LUTV’s Lion Pride Sports speaks with Lindenwood gymnastics head coach Jen Llewellyn about her coaching experience. This segment is part seven of a 10-part series of interviews with the head coaches of spring teams. 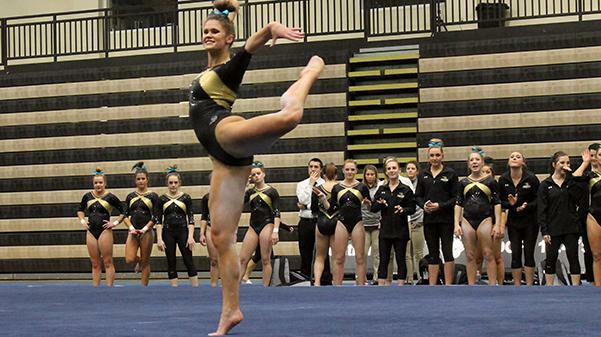 Lindenwood gymnastics won its home opener on Jan. 19 against Centenary College and the University of Alaska-Anchorage. The Lions totaled 194.5 points for the meet, beating out runner-up Alaska by 6.2 points. Centenary ended the meet with a final score of 184.125. Although the team was successful in its last competition, its season did not start out as such. Lindenwood fell to Texas Woman’s University during the first game of the season on Jan. 12. Texas ended the meet with a final score of 193.525, just 1.9 points ahead of Lindenwood. Three days later, the Lions defeated Southeast Missouri State in one of their best road meets in program history. According to the Lindenwood Student Life Sports website, eighteen of the 24 routines that the team performed scored at least a 9.7. Lindenwood’s final overall score was 194.650. The team will head to Seattle, Washington, on Jan. 26 for a tri-meet. Lindenwood will be competing against Seattle Pacific University and the University of Wisconsin-Eau Claire. The meet starts at 9 p.m. CST.